Cabo San Lucas is a unique, fun destination, adored by everyone from A List Hollywood celebrities to family groups. Over 4.9 million people flew through Los Cabos International Airport last year to sample the land where the desert meets the sea. To me, the biggest factor making Cabo more desirable than other destinations is the sun. If you live in more temperate climes, gray skies, dampness, rain — even snow — may affect your lives throughout the year. Cabo’s magic solution is its minimal rainy weather. The desert landscape is hardly touched by precipitation, and the arroyos that you cross on your scenic drive from the airport may see 10” of rain per year, about 25% of what New York or Seattle receives. As Cabo is located above the equator at the same latitude as Honolulu, the sun is strong and the tonic of sunshine and surf will make for a paradise of a vacation. Here are suggestions for the top six things to do with your family in Cabo; you can find many more through the tourism office. If you are anticipating visiting between December and April, be aware that it’s whale season. The humpbacks migrate to the Sea of Cortez to start their families and enjoy the warm waters. The experience is like watching science in the real world, and you won’t get tested. There are many whale watching tours where you can observe all the activity. If you haven’t seen one of these extraordinary creatures, this is the time to do it. On the opposite end of animal size and calendar parameters are turtle encounters during summer. Specifically, kids love the Ninja Turtle characters and respond with great excitement to turtle hatching time on the beaches. Eggs are usually laid between July and September, and within a month and a half to two months, baby turtles hatch. Cabo Outfitters Sunset Turtle Release lets you take part in the conservation of endangered sea turtles. Meet a certified guide in the nursery camp and choose a turtle to “adopt,” name it, and then liberate it along with the rest of the nest of hatchlings. Watch them as they waddle to start their new life in the ocean. You’ll receive a certificate of adoption as well. Nearby San Jose Del Cabo is an older, more colonial sister to the energetic Cabo San Lucas and its beachfront highrises. As a more workaday community, the pace is less busy and you can relax in the tree-filled plaza in the main part of town. Your family can have a pleasant meal during midday and savor the atmosphere of a non-resort destination. It is about 20 miles from Cabo San Lucas, and a whole different world. There are beaches, museums, and a dolphin encounter as well as many galleries in a fast growing Arts District. Follow artists from all over the world in many different mediums. Maybe find something to take home as a last memory of your perfect vacation. Between November and June, San Jose Del Cabo has an Art Walk every Thursday from 5 to 9pm. It’s easy to get there by rental car, taxi, tour bus, or local transit. You can plan to take a day trip to Todos Santos, a much smaller version of San Jose Del Cabo and a 40-mile ride along the Pacific Ocean coast. With an anthropological museum in town, there are a few things to see. Lunch at The Hotel California (of the Eagles’ 1976 hit song fame) is almost obligatory. With open plazas and instrumental guitarists it’s a great experience. The beaches nearby are legendary for surfing, but not for swimming. This is what Cabo was like 25 years ago; quiet, sun laden, and almost devoid of any hotels. As an expatriate community, it has a different flair than other places in Southern Baja California. Boasting of art galleries as well, you will experience a much different pace and setting from Cabo San Lucas. Todos Santos is reachable by rental car or tour bus. An enjoyable family outing to add to the vacation can be achieved by taking one of the many boat tours available on the Sea of Cortez, which is relatively calm as compared to the Pacific. 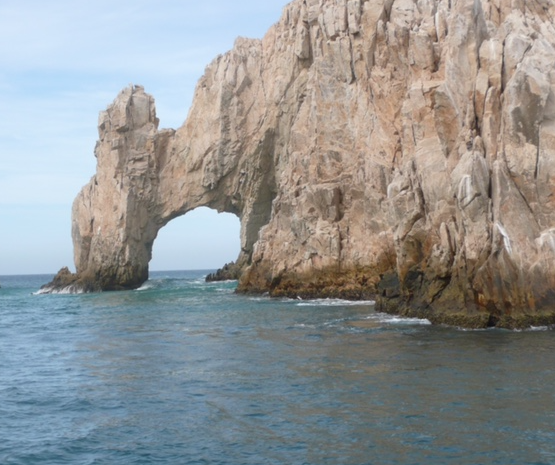 Cabo Adventures, one of the tour operators, offers many choices from 2-10 hours in duration. The Luxury Day Sailing was sampled, and it’s perfect for anyone 8 years old and up. A beautiful sailing yacht brought us to a protected beach for snorkeling, swimming and paddle boarding, and provided a tour of the end of the Baja California peninsula on the way to the beach, with some actual wind sailing on the way back. Snacks, beverages and a wonderful lunch were all provided. The four-hour cruise was most enjoyable and unique. Other adventurous day trips provided by Cabo Adventures include dolphin encounters, a camel tour along the beach, mountain biking, and a fly boarding experience, which lets you hover over the water. If the budget allows, any of these make for amazing selfies and another great family adventure together. There are many wonderful places to stay in the Cabo area, running the gamut from cozy little hotels to five-star luxury resorts. Since Mexico and Baja California Sur have made news recently with their U.S. Department of State travel warnings, however, I urge you to research the destination before you decide if it’s for you. If the budget is a bit flexible, opt for a resort that offers all the bells and whistles. 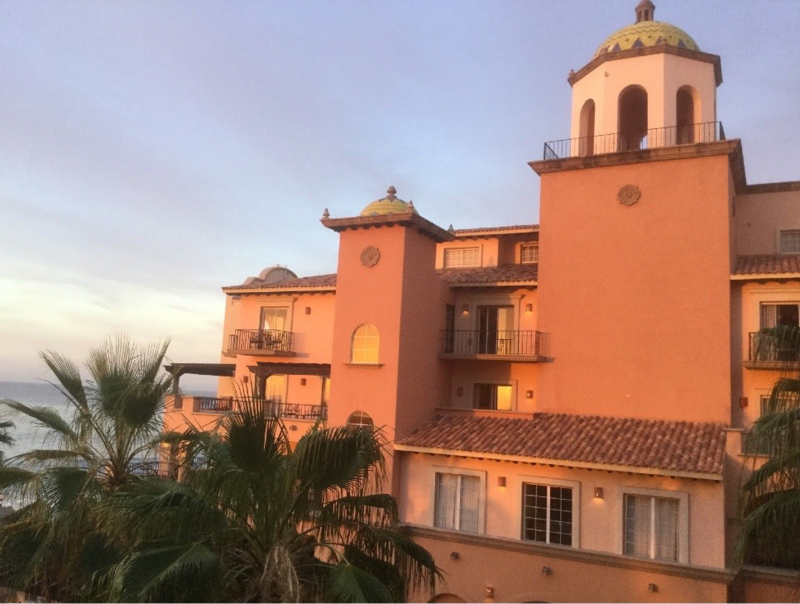 Allison Tibaldi enjoyed her visit at the 270-room and suite Sheraton Grand Los Cabos last October, and chronicled it for the FTF website which you will want to review. I paid a follow up visit in June of this year which brought out and confirmed all she had written, and more. The food available at all the restaurants was outstanding. The Sheraton Grand is not an all-inclusive resort so you pay for the luxury of individual choices but, by the same token, your family vacation will be remembered for many years by everyone. No matter what you do, enjoy your time there… and bring sunblock!